After a decade of lobby scandals and debate on how to secure transparency and ethics, the European Commission needs to go beyond half measures now more than ever. European Commission President Jean-Claude Juncker. Olivier Gouallec/Demotix. All rights reserved.Ten years ago in the summer of 2005 a group of NGOs came together to form the Alliance for Lobbying Transparency and Ethics Regulation (ALTER-EU). Back then, the EU's transparency register did not exist and the secrecy around lobbying in Brussels was shocking. If you were to ask one of the many large consultancy firms in the EU quarter at the time which multinational companies they were lobbying for, they would simply refuse to answer. They were able to argue that they had promised their clients confidentiality and that they had no obligation to be transparent. Today most lobby consultancies are registered. They disclose at least some basic information about their clients and also an indication of how much they spend on lobbying. Whilst progress has been made, genuine transparency or adequate regulations to prevent conflicts of interest, undue influence and the capture of decision-making by narrow economic interests are all still far from being achieved. The Commission's typical pattern of reaction to the many lobbying scandals that have emerged over the last ten years has been first denial and dismissal of concerns, and then, in some cases, a half-hearted proposal for reforms that do not effectively solve the problems. ALTER-EU was launched when Estonian Commissioner Siim Kallas took Brussels by surprise when he proposed the setting up of a lobby register. This idea instantly faced heavy backlash both from corporate lobbyists and from within the Commission itself. Three years later a voluntary register was launched; it was both a breakthrough and a serious disappointment. On the one hand, positively, lobbyists were, for the first time ever, expected to register and disclose for whom they worked and how much they were spending. On the other hand it was a major disappointment because it was voluntary, which predictably resulted in low sign-up rates and limited, often unreliable, information. Subsequent reforms were mere baby steps, albeit in the right direction. If you visit the register's website today you will still find that many large corporations, law firms and other key lobby players are missing and information is often wildly inaccurate, giving a misleading image of what's really going on in EU lobbying. This sad situation reflects the lacklustre approach and dearth of political will on this issue throughout the ten long years of Jose Manuel Barroso's Commission presidency. The same pattern has emerged in other key lobby regulation battles that the ALTER-EU coalition has fought during its first ten years. In 2010, when a record number of ex-Commissioners from the first Barroso Commission went through the revolving door into industry lobbying jobs, the Commission initially denied that there was a problem. Only when the political controversy over the glaring conflicts of interest of ex-Commissioners like Günter Verheugen and Charlie McCreevy continued to intensify, did the Commission introduce limited changes to its Code of Conduct. Similarly, it was only at the European Parliament's insistence that a modest one-year cooling-off period was introduced before Commission officials could move into lobbying jobs. The many new controversial revolving door cases that have emerged since then have shown that the Commission's revolving door rules remain inadequate and poorly implemented. ALTER-EU has, for years, called for clear and binding rules to end the continuing dominance of lobbyists representing commercial interests in the Commission's many advisory groups, or so-called expert groups. This dominance can have devastating impacts. For example, in the years before the financial crisis the advisory groups that helped prepare EU banking regulation were captured by banking lobbyists. This predictably resulted in the creation of too-soft regulations that enabled the financial bubble to emerge, sparking the 2008 crisis. Still today the Commission refuses to introduce binding rules and we continue to see new examples of expert groups teeming with corporate lobbyists eager to shape draft EU legislation. The consistent refusal to take the kind of determined action needed to prevent corporate capture scandals reflects a flawed political culture in the Commission. Excessively close contacts and cooperation with big business lobbyists are considered natural and unproblematic, because large parts of the Commission see it as their mission to promote these interests. The EU's trade department, for instance, prepared a negotiation position in the TTIP talks with the US by actively seeking guidance from big business lobby groups, while other interests were largely ignored. The result: negotiations were launched towards a deal with the US including controversial investor-to-state courts (ISDS) and a regulatory harmonisation system that fits corporate interests but would have disastrous consequences for EU citizens. Last summer, Jean-Claude Juncker made a surprise promise as part of his campaign to become Commission President. He said he would introduce a mandatory lobby register. This was the first time ever that a Commission President had made such a promise and it represented a U-turn on the previous Commission's voluntary approach. Already a few months later, however, it became clear that the Juncker Commission was shying away from introducing a legally binding lobby register, preferring a lighter approach that is unlikely to deliver genuine transparency. New rules were introduced in December 2014, blocking unregistered lobbyists from having meetings with Commissioners and just over 200 top Commission officials. All meetings that Commissioners and top officials have with lobbyists are to be listed online. While this was refreshing compared to the inertia of the Barroso years, these measures are too limited to fulfill the promise of mandatory lobby transparency. The ban on meeting unregistered lobbyists should clearly be extended to all levels of the Commission. Making all lobbyists sign up and disclose reliable information requires legislation, allowing for sanction and strict enforcement. Another new measure announced by Juncker was less remarked-upon but potentially more important. 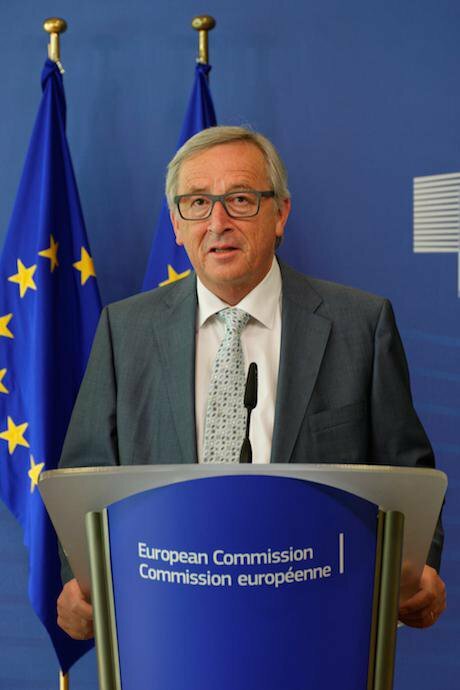 In the new guidelines for the work of the Commission at the end of 2014, Juncker stated that the “Members of the Commission should seek to ensure an appropriate balance and representativeness in the stakeholders they meet”. Of the new measures, this is arguably the most far-reaching, with the potential to change the political culture, including in DG Trade and other Commission departments suffering from deeply rooted patterns of privileged access, if not regulatory capture. Unfortunately, it appears that Juncker has not made serious efforts to ensure that this new rule is implemented. Research by Transparency International and ALTER-EU published in June revealed that more than 75% of the lobby meetings of Commissioners and high-level Commission officials are with lobbyists representing business interests. In areas such as financial regulation, the internal market and international trade policy 80% or more of the meetings are with big business. This extreme imbalance in access to decision-making is devastating for public trust in the Commission. ALTER-EU has written to Juncker to remind him of this broken promise, insisting that he introduce “measures to ensure a more balanced representation of stakeholders in high-level Commission meetings, including limiting the number of meetings with big business lobbyists". The implementation of Juncker's promises were delegated to Vice-President Timmermans, the mediagenic Dutchman who has cultivated an image as a common-sense, can-do politician bringing a breath of fresh air to the Brussels bubble and promising a break with the bureaucratic habits of the past. The reality so far, however, has been disappointing. Timmermans is clearly far more interested in that other Juncker Commission priority, the 'Better Regulation' initiative, which is essentially a deregulation agenda that has been greeted with enthusiasm by Brussels' corporate lobbyists. In debates about lobby transparency, Timmermans disappointed within mere months of taking office with his use of unconvincing old-school bureaucratic excuses for not broadening transparency measures. Disclosing a wider range of lobby meetings, Timmermans argued, would violate personal data protection of officials and lobbyists. Hardly the kind of arguments that will make EU citizens feel the European Commission has changed its old ways. Clearly, there is a strong need for campaigning to make the Juncker Commission deliver on its promises. ALTER-EU is now developing a pan-European citizens campaign for “Full Lobby Transparency Now”, with activities in Brussels and in the member states to promote a high-quality mandatory EU lobby transparency register and also similar registers on the national level. After ten years of ALTER-EU battling for transparency, ethics, accountability and democracy in EU decision-making, some progress has been made in the form of new rules and procedures. These rules have proved to be inadequate, however, and the Commission has yet to learn the key message: half measures do not work. This is why there is still no genuine transparency nor any meaningful protection against conflicts of interest and why the capture of decision-making by vested economic interests continues unchecked. Change is desperately needed at a time when public trust in EU institutions is reaching historic lows. The EU's recent prioritising of financial sector and multinational profit over the basic rights of citizens – the treatment of Greece being the most striking example - will only reduce trust levels further. Public awareness about the dangers of corporate capture and support for ALTER-EU's demand for change has never been bigger, however. Ten years ago, campaigning to expose and challenge big business influence in Brussels was a significantly more lonely endeavour. Now, in the European Parliament, more than 180 MEPs are signed up to a pledge to “stand-up for citizens and democracy against the excessive lobbying influence of banks and big business”. Whilst we are still a long way off what needs to be achieved, with enough public awareness over the years to come we can build enough pressure to get the meaningful change that EU citizens so badly need.